For the first time at the 2016 General Assembly, which is taking place in Vienna, Austria, from 17–22 April, we will be implementing a Student Reporter Programme. A team of volunteer early career researchers will report, via the Union’s social media outlets and blogs, on the findings presented at scientific sessions and press conferences during the General Assembly. What is involved in being a student reporter? We are giving the opportunity to four geosciences students with an interest in science communication, pre-registered to attend the conference, to be involved in reporting, science writing, videography and social media activities during the conference. 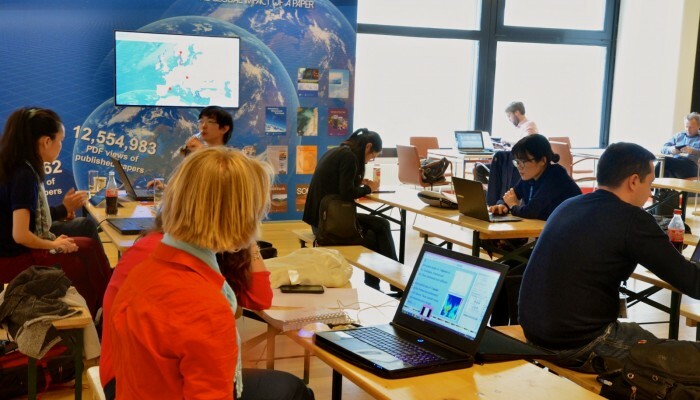 The student reporters will attend scientific sessions, as well as Union-wide sessions, such as the Great Debates and Medal lectures, and report on the findings presented on the EGU Blogs. They will work closely with the division bloggers and social media managers, who will provide the main outlet for the content produced by the student reporters, via the division blogs and division social media channels. Some findings and those which cover scientific disciplines not represented by the division blogs will be included in the EGU’s official blog, GeoLog. The successful candidates will be part of the Student Reporter team, coordinated by the EGU’s Communication team. The reporters will have access to the press centre, interview rooms, as well as being encouraged to attend the science-communication related short courses at the conference. Reporters will also be given access to a range of science-communication resources to develop their communications skills. Interview-style reporting will be encouraged, giving reporters the opportunity to interact with prominent scientists and keynote speakers. This is an unpaid opportunity for early career geoscientists with an interest in science communication who want to gain experience in science reporting via online platforms at a major scientific conference. The positions are open to University students (undergraduates or postgraduates) in the Earth, planetary and space sciences wishing to gain experience in science outreach. Candidates must be pre-registered to attend the conference when submitting their application and available for an introductory meeting on Sunday the 17th April in Vienna, prior to the conference starting. Applicants must have a good command of English and good computer and internet skills. The deadline for applications is 11 March 2016. Application documents (in English) should be submitted by email in a single file to Bárbara Ferreira, the EGU Media and Communications Manager (media@egu.eu), and Laura Roberts, the EGU Communications Officer (networking@egu.eu). Bárbara and Laura can also be contacted for informal enquiries.